The Evolution HT is Cooper’s All-Season Highway tire developed for crossovers, sport utility vehicles, and commercial pickup trucks. 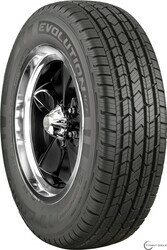 The tire features Cooper’s branded 3D Micro-Gauge™ Siping that provide wet traction capability and stability. Distinctive tread pattern deliberately positioned reduces on-road tire noise, while tread outline delivers uniformed wear and extended tire life. Wide water channels allow for efficient water removal from under the footprint. A silica-enhanced compound increases the Cooper Evolution H/T tire’s capability to deliver improved traction in wet and dry conditions while helping to transfer heat to maintain the tire’s coolness. The silica compound helps to reduce braking distance and increase fuel efficiency. The Evolution HT provides the ideal combination of responsive handling, comfortable ride, and all-season grip and comes with a warranty of up to 60,000 miles. The Evolution HT is available in 28 regular sizes to fit the rising SUV, CUV, and light truck market.